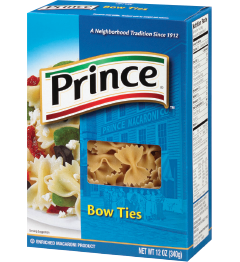 Bow Ties, also known as farfalle, is an Italian word for butterfly. No surprise that the shape looks like a butterfly. Bow Ties come in several sizes, but all are formed from a rectangle or oval with two sides trimmed and the center pinched together.